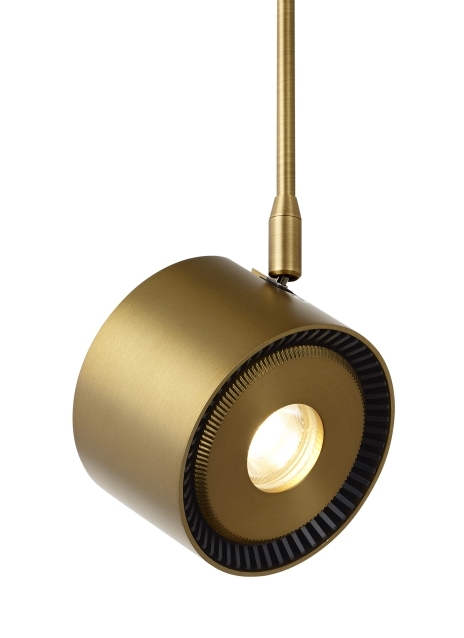 The Iso display head by Tech Lighting combines sleek design with lighting precision. Light hits in the desired location with beam spreads of 20°, 30° or 50°. These wide ranges of light spread are made possible with the Iso due to its full 360° head rotation and 90° pivot. Customize the Iso by combining it with the complementary Monorail or Monopoint systems by Tech Lighting. The Iso head is available in two on-trend finishes and can be customized to hang at four distinct stem lengths. This low-voltage display head is ideal for commercial lighting applications such as retail stores, libraries and galleries. Includes field replaceable 16 watt, 780 delivered lumens, 3000K, 80 CRI LED module field replaceable LED module and upgradeable due to the solderless connector. Dimmable to 10% dimmer type determined by low-voltage transformer. The heat sink remains with the fixture minimizing any waste at the end of the lamp module's life. The head rotates 360° and pivots 90° to direct the beam. As a general rule when using the ISO Head, we do not recommend using greater than 33% of the maximum wattage specified for the low-voltage transformer due to the inrush current requirements. For assistance in calculations, please contact our Technical Support Department. Available in two on-trend finishes and can be customized to hang at four distinct stem lengths.